Many small business owners have a love-hate relationship with Yelp. The website allows customers to find and rate local businesses—everything from dry cleaners to dentists to diners. Get a good review and bask in the glow of positive marketing—get a bad one and it’s a ding to your reputation. But regardless of how you feel about Yelp, it appears that the crowd-sourced review site is here to stay. The platform celebrated its 10th anniversary this year and now receives 138 million visitors every month. It’s become the leading business review website, with users—or “Yelpers”—contributing 61 million reviews. Sheer numbers aside, there’s also the monetary aspect. A Harvard Business School study found that amongst Seattle restaurants, a one-star increase on Yelp resulted in a 5-9 percent increase in revenue. And a Boston Consulting Group survey shows that small business owners with a free Yelp account earn about $8,000 per year from the site, while those who purchase Yelp ads earn more than $23,000. So it’s important for small business owners to learn how the site works and use it to their advantage. “While the reviewers have a lot of power in determining how your business is represented on Yelp, you as a business owner also have some power in how well you represent yourself,” said Diana Lamon, member of Yelp’s Small Business Advisory Council and co-owner of Peaches’ Smokehouse and Southern Kitchen, a Los Angeles-based food truck. Your business may already have a Yelp page, but as an owner, you need to “claim” it. 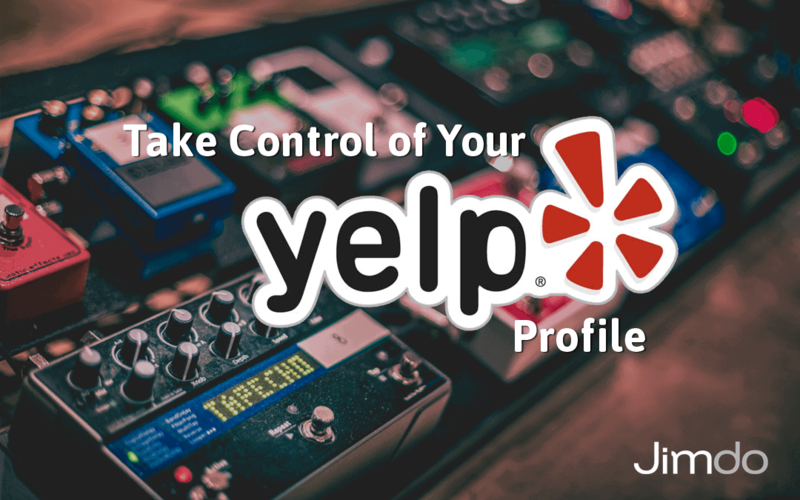 This will allow you to update the profile page with relevant, current information and access Yelp’s tools for business owners. If the page doesn’t already exist, you can create one. In the BCG study mentioned above, only 11% of small businesses had claimed their profiles, so make sure you do this! Once you create your page, don’t forget to check in periodically to keep your hours and other information up-to-date. Inaccurate or out-of-date information will inevitably frustrate customers. Once you’ve claimed or created your page, it’s important to create a robust presence. Be sure to list critical information like business hours, contact information, the link to your website, menus or a list of services, and a 3,000-character description of your business. An important question to keep in mind is: What would inspire customers to walk through my door? Tell users right away what service your business offers, as well as what qualities or features make you unique compared to competitors in the area. Be sure to also include key search terms in your profile. Yelp pages frequently appear high up in Google search results, many times even ahead of your actual business website! “The more information a consumer has when making a buying decision, the better,” said Morgan Remmers, Yelp’s manager of local business outreach. Photos are especially important for attracting customers. Remmers told me that people searching Yelp business profiles stay on a page with photos two-and-a-half times longer than on a page without. And some business owners believe photos help bring in more customers. “We have customers who come up to us and say, ‘I saw this great photo of your pulled pork sandwich or I read this awesome review of your fried chicken sandwich, I’d like one of those,’” Lamon said. Yelp offers a number of free tools that allow you to track and analyze how visitors are engaging with your profile—data that can then help inform your business strategy. For example, the Activity Feed shows users’ demographics, as well as when they call a business, map directions, or move from Yelp to the business website. The Revenue Estimate Tool predicts the potential earnings attributed to your Yelp presence. And Yelp offers webinars, how-to videos, and other resources through its support page. Owners can create coupons or special offers exclusive to Yelpers, known as Yelp Deals. Some business owners find that deals help increase patronage. 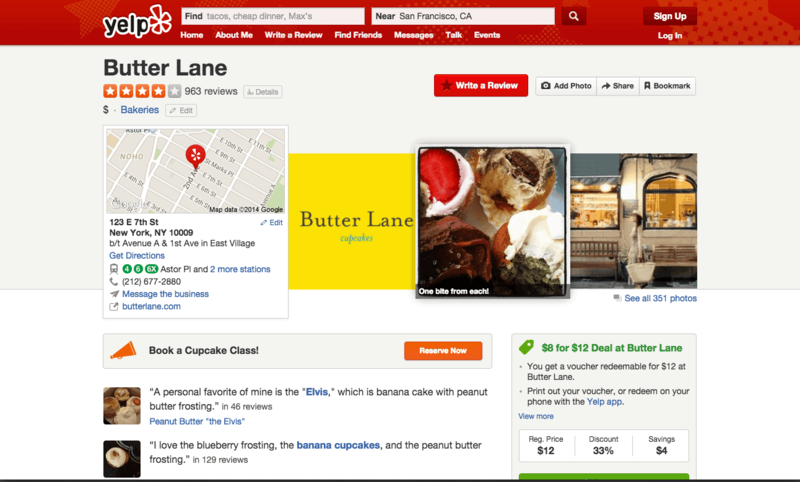 Lisa Liu, partner, and co-owner of Butter Lane bakery in New York City, offers a Yelp Deal where visitors can spend $8 to receive $12 worth of goods. “Every other day, there’s at least one person who bought our deal from Yelp,” she said. Butter Lane Bakery’s Yelp profile has photos and a Yelp Deal for customers in the lower right corner. These Deals are especially attractive to people using smart phones, which make up 61 percent of Yelp’s users. You can also set up a Check-In Offer, where you reward customers with a coupon if they “check in” to your business via their mobile device. Visitors can then share check-in offers and deals with their friends via Yelp, Facebook, and Twitter. Yelp actually discourages owners from asking patrons to leave a review—reviews are only considered authentic and meaningful if they happen organically. That being said, there are still ways to make patrons aware of your Yelp presence. Remmers recommends displaying a “Find Us on Yelp” sticker on your window or front counter (request one here). You can also post an image and link on your website or in your email signature that directs visitors to your Yelp profile. Yelp offers two ways for business owners to respond to reviewers—private messaging or publicly replying to reviews. Create a dialogue by consistently responding to your reviewers. Private messages—which are much like sending a personal email—are a great way to thank a customer for a positive review or let them know about other services or specials that might appeal to them. You can also private message someone who left a negative review in order to learn more about their experience. Never respond angry: Facing harsh criticism can be tough. Take some time to cool down before responding to a negative review, or have someone else read your proposed response before replying publicly. Always be diplomatic and polite: Remember that you’re talking to paying customers! Thank the customer for their feedback, and, if applicable, highlight changes you’ve made since his or her visit that could alleviate the concern. Customize your response: Read each review thoroughly and respond specifically if you can. Be timely: Don’t let a review languish. Respond within two weeks. Upload a nice photo: Yelp requires business owners to upload a photo of themselves before messaging a reviewer. Make sure your photograph is clear and inviting–no sunglasses, shadows, or frowns. Optimizing your Yelp presence is essential for tapping into the growing community of Yelpers and anyone who finds your business through internet search. But it’s important to throw many digital “hooks” into the water in order to lure in new customers and diversify your online presence. Create a website for your business, where you can provide many more resources and information beyond those allowed in your Yelp profile. You should also stay active in social media, especially on Facebook and Twitter. Business owners are understandably hesitant about advertising they can’t control, and reviews on Yelp certainly fit that description. But ignoring the website is a missed opportunity. Yelp provides a way for business owners to hear directly from their customers and attract new ones. Taking control over your Yelp presence by employing best practices can help ensure that the website works as a marketing tool, not a source of anxiety.